Honestly every day is a new challenge and before I step foot into my days I step right over to my Touch Brewing System. Our latest challenge is that with all the stuff going on in our home, we often ‘slept’ in by accident leaving less time to get ready in the morning because we are just exhausted from our personal lives. One morning we turned my one single serve brewer on and it took forever to warm up. Sick of the K-Cup portions and the inability to brew whatever size we wanted from single to a carafe quickly, I gifted my daughter my single portion brewer and opted for faster, bigger and bolder brewing which makes more sense in my home. My husband wants to join in on a fast cup of brewed coffee, but he has under 2 minute to get out the door, and drop one child off at the bus, so I had to find a way to get coffee faster, bigger and bolder to meet all our needs and that meant getting into TOUCH with a new brewing system. Lavishly live coffee out loud with Faster, Bigger, Bolder Brewing For Your Coffee. What did I have before I had TOUCH? A Keurig of course and that is long gone! My daughter took it and I have never looked back because it’s defiance to getting it just right drove me crazy! I love that I can use any K-Cup or XBold Cups with this, and the XBold Cups actually provide 30% more coffee and the flavor is exceptional. Now remember, I am not a Coffee Junkie, but I do have a preference for FRESH BREWED and Bold and the Touch delivers on both platforms! The brewer starts in under 20 seconds even after it had a rest all evening. No it is not programmable, but seriously you don’t have 20 seconds to get your chug on? I doubt that, because when I power it on, I fill the cat’s water bowl and I am not even done and the TOUCH is waiting for me(slow poke)! The coffee is always a piping hot 195-200 Degrees Fahrenheit and I often add 2 ice cubes to my brew which seems to drop it right to 130 Delicious Fahrenheit degrees to drink at a perfect temperature. You know I am all about the lavish and the need to have on demand so this works for me! Why is the Touch brewed coffee so darn good? Perhaps it is the fact that the hot water has more contact with the coffee grounds, which ensures that all of the coffee flavor is extracted. The warmed up water(remember ready to go in 20 seconds is the difference maker. Here’s something to get watered up about! There is a removable 90-ounce water tank has a greater capacity and it hardly takes up any room, so less filling it, and less awkward in the hands. What else makes this TOUCH so cool? The decision you make on the cup size is what drivers the amount of water warmed, so you are not warming up too much water, you are just calling up what you need. The buttons are all illuminated –Hello Sleepyhead eyes, you can still figure out what you are doing even if you are dusting off your eyes from the sandman. How I love the energy efficiency of the TOUCH brewing system because, the machine turns itself off after use, making it energy efficient unlike other coffee brewers on the market! (save energy, save money, shop more!) Lavishly live that morning cup of coffee and all the other cups during the day out loud with Faster, Bigger, Bolder Brewing For Your Coffee! Now I want to give you one, as I think it will rock your cup of caffeine! Let’s keep things simple and clear: US Entrants Only, and you must be 18+ in order to enter. Winner will be notified by email and will have 24 hours to respond or a new winner will be chosen, no exceptions. No P.O. Boxes accepted as mailing addresses. Giveaway begins 1/12/16 and ends 1/25/16 at 11:59 P.M. EST. Good luck. All entries will be verified. I love the touch feature and that it is ready in 20 seconds. 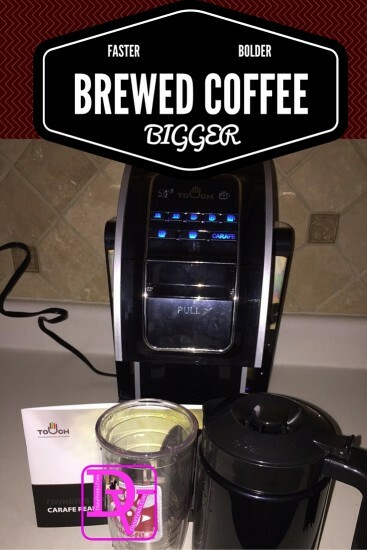 It is a great versatile coffee maker my whole family would love. I love the touch feature and that it is ready in 20 seconds. I like how it turns its self off.. I like that it has more than one serving. Many features are great! 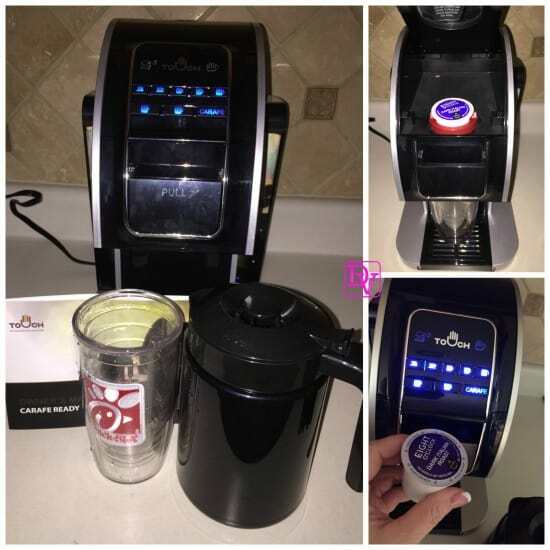 You can still use K-Cups and also it’s so fast and hot!! Love that 🙂 By the time I would feed the cat and dog boom my java is ready for me I like that!! I love the 8 cup options!! I love the touch feature itself. rather then pushing buttons. Im a coffee fanatic and LOVE this machine! I like that it turns itself off. One less thing to worry about in the big scheme of things. I’m intolerant to caffeine but that machine looks amazing!! I need a new coffee machine and I haven’t been able to decide which one I want. I think this may be a better option since hubby and I love making different types of coffee. What a cool coffee maker. I have to show this to my husband. I want this for Christmas. This looks like something I’d put to a lot of use. I’ll have to check into it as I want my coffee FAST lol. They’ve come out with such cool coffee makers these days! Jennifer H recently posted..Show Me Your Best Mashin’ Max Game Face! Wow this looks like a great coffee maker. I love that it can hold such a big cup. This would be perfect for me because I’m a coffee lover, in that way it can make my morning easier. Ooh I need to look into this! My parents are big coffee drinkers, I bet they’d love this! Thanks for sharing! This would be perfect for my husband. He loves his coffee extremely strong and very black – we will definitely check this out! I like how it turns itself off. That is something I can’t seem to get anyone around here to get on board with! Oh! I love coffee makers like this. It’s really awesome. Thanks for sharing details about it. My husband is the coffee drinker in this family, and he has to use two K cups to get it strong enough. This may be something to look into! My husband would love this. He is a huge coffee fan, and needs a new machine. So something like this would be perfect especially for the days he works so early!